About a month ago, Eric and I were at the movie theater seeing...well, I don't actually remember what...and I saw a poster for About Time. Okay, if I'm being honest, I saw Rachel McAdams and then looked closer to see what the movie was...because I think it's been decided that I'll love anything with Rachel McAdams. And then I saw that it was made by the same people who did Notting Hill and Love Actually, two of my very favorite movies. After that, I could hardly wait to see it when it comes out in November. 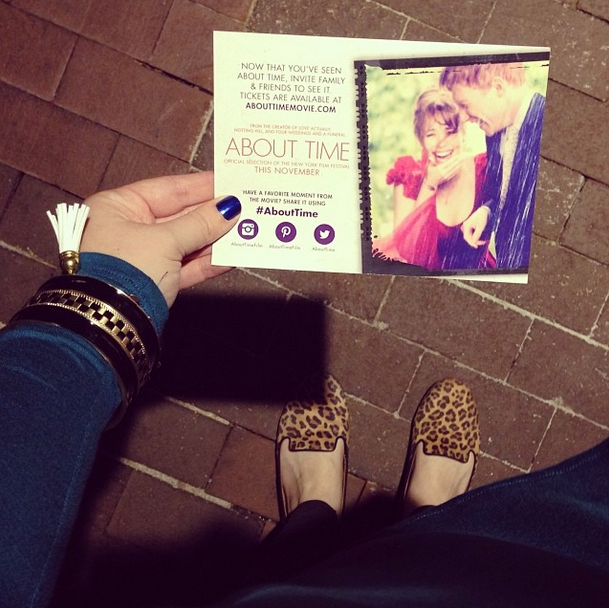 Lucky for us, Eric and I were invited to a sneak peek screening of About Time last night with our friends Adair and Philip. Y'all, it was so so good. Like bananas good. I've heard a lot of people say, "Oh, it's just going to be another Time Traveler's Wife. I don't know if I can watch Rachel McAdams in another movie about time travel." But it's so much more than that! 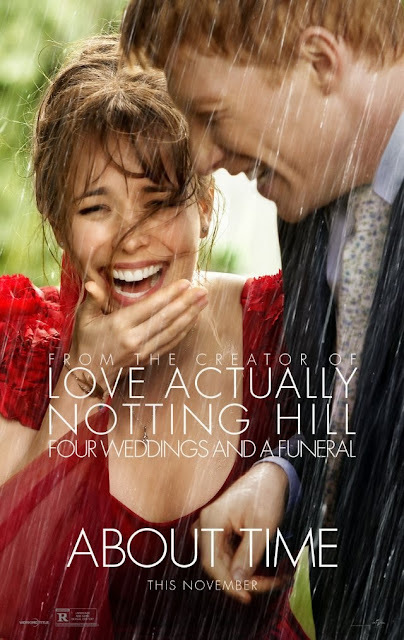 Sure, Rachel McAdams falls in love with Tim (played by Domhnall Gleeson) who can travel back in time, but at its core, the movie is really about Tim's relationship with his father (played by Bill Nighy), living life to the fullest, and appreciating the everyday. I am honestly beginning a serious love affair with this movie. It has a fantastic cast, and the soundtrack is completely perfect. About Time is funny and fresh and quirky and adorable, but it's also heartwarming and thought-provoking and incredibly moving. It's is a love story, certainly, but it's not the love story you would expect. It's about loving everyone around you. It's about loving what makes you different. It's about loving even the little struggles like missing your train or spilling wine on your coat. It's about loving every day of your life and realizing that even though things aren't perfect all the time, life is still beautiful. This truly is a gorgeous movie. I can't remember the last time I cried so hard at a movie! Eric cried, too, so I promise it's not just a chick flick. In fact, I don't even know that I would label it as one at all. It made me want to embrace life and be joyful every minute of every day. You only get one life. What are you going to do with it? About Time is out in theaters on November 1st. You must go see it! This movie looks awesome. And I LOVE Bill Nighy (thanks to Love Actually!) I'm so jealous of all the bloggers who got to go see this already!